Fragile labels are actually pretty nifty when it comes to packing boxes for moving. They work in a simple way; you get your fragile and breakable items, have them packaged securely, and put a fragile label on the package. This way, you will be able to let anyone who handles the package know immediately that the constituents of the package are in fact fragile. The major purpose of fragile labels is the fact that they are able to create awareness. Moving boxes and cargo packs are usually opaque, and this means that people are unable to see through them. What is a person supposed to know that the contents are fragile? This is where these fragile labels come in. When you slap a fragile label on something you are creating a level of awareness and ensuring that anyone who sees the label will know to treat the package with more caution. Fragile labels can go a long way to save your cargo from damage as it makes people extra aware of this package and as such, they will know to treat it and handle it more carefully. The fact that moving officials will be able to see these fragile labels and treat your fragile cargo with more caution means that fragile labels will definitely be able to save you some money. Your stuff won’t get damaged and you won’t have to spend money to get new things anytime soon. When you think about how much it will cost you to get a fragile label and how much it will otherwise cost you to get a new laptop or kitchenware or any other breakable and perishable tool, you will definitely come to find out that fragile labels are not in any way expensive. These labels are pretty cheap (although the prices on various platforms vary a lot) and you will be able to get a lot of them when moving. 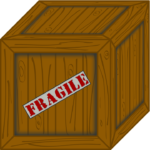 Fragile labels are also very light in weight (they hardly weigh anything), and they will be useful without having to put any extra weight on the cargo itself.